When remodeling a kitchen, attic, basement or other room in your home you may have to add electrical wires to an electrical box. There is a limit to how many wires you can safely place in a specific size of electrical box. As well, the more wires you place in an electrical box, the more likely you are to make connection errors. Figure 1 - Standard devices count as 1 strap. Each gauge of wire requires an amount of cubic inches of available electrical box space. Table 1 provides the cubic inches necessary for each common residential wire gauge. Figure 2 - Electric range receptacle would count as two straps. If the electrical box is also going to house a switch or receptacle space allowance must be made for the device being used. The space allowance for a switch or receptacle is based on the size of the device. The term used is called a strap . The number of straps is based on the size of the device – the area that it covers. From a laymen standpoint an individual strap is the size of a standard switch or receptacle, as shown in Figure 1. So if the device that you are installing takes up the space of two standard switches and/or receptacles, it would be counted as two straps, as shown in Figure 2. Each strap that will be mounted on the electrical box is equivalent to two of the largest conductors entering or exiting the electrical box, even if the largest conductors are not connected to the electrical device that is also mounted in that electrical box. If the electrical box has an internal clamping mechanisms, as shown in Figure 3, to hold the electrical wire in position, the clamping mechanisms take up space within the electrical box and hence must be given a space allowance. One or two internal clamps in an electrical box are the equivalent of one of the largest conductors entering or exiting the electrical box. Pigtails that originate within the electrical box and do not leave the electrical box, as shown in Figure 4, are not counted. Multiple ground wires are only considered to be one conductor. It must be calculated as the largest ground wire that enters the electrical box. As an example you have a two 14 gauge and one 12 gauge ground wire in the electrical box. When calculating the available space you would allow for one 12 gauge wire for all three ground wires. Each wire is accounted for. 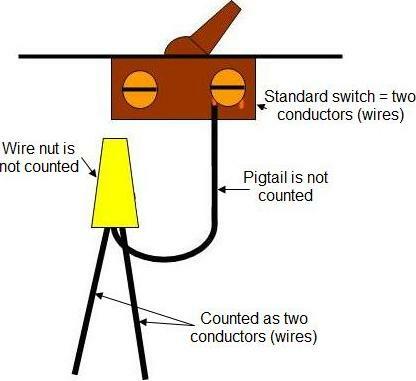 A wire that enters an electrical box and is connected to another wire within the electrical box which then exits the box is considered to be two wires for space allocation calculations, as shown in Figure 4. The wire nuts used to join wires together are not considered in the space allocation calculation.